Aomori is the capital city of Aomori Prefecture, the Northernmost state of Japan's Tohoku region North of Akita, Iwate, Miyagi and Fukushima prefectures. The city faces the Tsugaru Strait via Mutsu Bay to the North and the Hakkoda Mountains to the South. It has the biggest seaport in the prefecture. 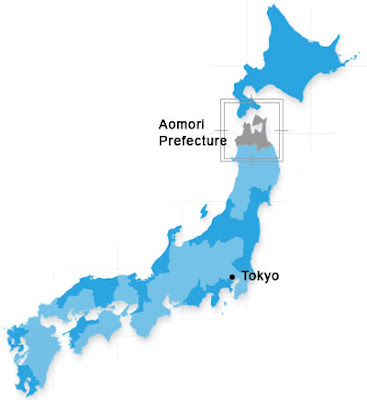 Aomori ”青森” literally means blue/green forest. Snow and cold weather characterize the winter climate in Aomori. The city and its surrounding area is renowned for its heavy snowfall, which is said to be the heaviest among all Japanese cities. In 1981 the city recorded a maximum snow cover of 196 cm. Aomori is especially famous for its apple orchards. The Seikan Tunnel is a 53.85 km (33.46 mi) railway tunnel in Japan, with a 23.3-kilometre (14.5 mi) long portion under the seabed. It is the longest undersea tunnel in the world. It travels beneath the Tsugaru Strait — connecting Aomori Prefecture on the Japanese island of Honshū and the island of Hokkaidō. Before the Seikan Tunnel opened, Aomori's port connected the city via ferry to Hakodate in Hokkaidō, serving as the main entrance to Honshū for passengers and cargo to and from Hokkaidō. 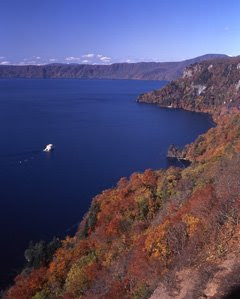 Lake Towada, a beautiful caldera, lies on the boundary between Akita and Aomori Prefectures. 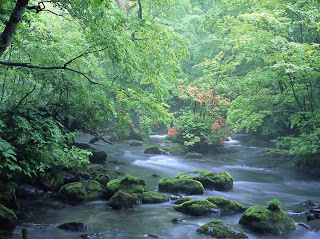 The Oirase river drains Lake Towada; in the summer it is refreshing and in the autumn the leaves are breathtaking. It is the largest caldera lake in Honshū island, Japan. Located on the border between Aomori and Akita prefectures, it lies 400 meters (1,800 ft) above sea level and is 327.0m (1,073 ft) depth,. With a surface area of 62.2 km², Towada is Japan's 12th largest lake, its bright blue color due to its depth. The Oirase mountain stream is the only stream that has Lake Towada as its source, and the upper reach of the stream runs for 14 km. The area around the stream is famous for its splendid landscape and the beauty of the colorful autumn leaves. Tsugaru ben is one of the local dialects spoken in Northern Japan. It is not well understood by most Japanese people outside of Aomori. The Tsugaru clan was a Japanese samurai clan originating in northern Japan, Mutsu Province. A branch of the local Nanbu clan, the Tsugaru rose to power during the Azuchi-Momoyama period. It was on the winning side of the Battle of Sekigahara, and entered the Edo period as a family of lords (daimyo) ruling the Hirosaki Domain. A second branch of the family was later established, which ruled the Kuroishi Domain. 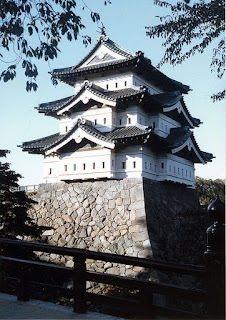 The Tsugaru survived as a daimyo family until the Meiji Restoration, when Tsugaru Tsuguakira of Hirosaki and Tsugaru Tsugumichi of Kuroishi were relieved of office. Their extended family then became part of the new nobility in the Meiji era.